It would be very disappointing if no one would study polish or russian philology at Vilnius University, says dean of philology faculty and head of Department of Lithuanian Studies Prof. Meilutė Ramonienė. You can study polish philology in Lithuania at two Universities – Vilnius University and Lithuanian University of Educational Sciences. Admissions are pending. Graduates of comprehensive schools in Lithuania, even those who graduated from polish or russian schools – do not choose to study mother tongue and literature at Vilnius University. This year as a part of reorganization of Philology Department, University announced renewing lithuanian, baltistic and slavic studies. ‘We perfectly know how important a word is – in private life as well as in business life. It is enough that foreigner pronounces even two words in lithuanian and we actually look at him graciously. Unfortunately polish and russian studies are not that common at Lithuanian Universities. It can be connected to political issues, but students should be taught the importance of philological education that can be received studying language and culture at university that has good lecturers. It allows graduates to do creative work as well as all practical work’ – highlights Prof. Meilutė Ramonienė. According to dean of Philology Department, expecting from studies only particular and tangible results is very harmful. Societies that head only to pragmatic aims tend to quickly face serious social problems. Solving these problems requires creativity and ability to adjust to occurring problems and it is task of humanities. Research on multilingualism show that countries in which citizens know more languages, educate specialists who are much better prepared to current labour market. According to M. Ramonienė Lithuania is lacking in creative and opened view on its’ neighbor. We do not teach their language, literature, history, we do not know much about them, whilst the relations are very tight. Specialists with proper educational background on polish, russian, latvian languages knowing culture of neighbor countries would bring a lot of good to Lithuania, says Prof. M. Ramonienė. 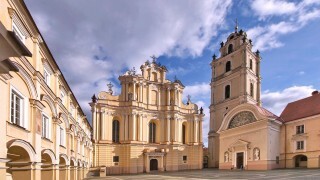 Polish philology can be studied at two Universities – Vilnius University and Lithuanian University of Educational Sciences. Studies at the best University in Lithuania – Vilnius University allow to gain double qualifications – in matters of polish philology with additional specialization in matters of any other faculty carried by Vilnius University. Polish Language, Culture Study and Didactics Centre of Lithuanian University of Educational Sciences invites to study polish philology with teaching specialization. From upcoming academic year polish philology is to be combined with early years learning (meaning early school pedagogy). Students who will be admitted to the university this year will be able to get triple specialization: bachelor’s degree of polish philology, qualifications of a polish language teacher and additional specialization – early years pedagogy.